Credit Counseling Center - Times Publishing Newspapers, Inc. The Credit Counseling is celebrating its 25th anniversary in 2019. Since 1994, the Credit Counseling Center, a non-profit organization, has helped 41,000 individuals repay debt, create and manage a household budget, improve credit scores, buy homes and prevent foreclosure. President Joan Reading joined WBCB’s Pat Wandling on her talk show, “Speak Your Piece” to announce this very special milestone! CCC’s expert staff specializes in solving financial challenges, and finding peace of mind for our clients. *Like Mary and Jack, trying to determine if bankruptcy made sense with all the debt they have or if the Credit Counseling Center’s debt repayment plan would work instead. *Or Charles, wanting to improve his credit score to get the best rate to refinance his mortgage. *And Janice, in the middle of a separation who found that help creating a new budget and reviewing her credit report was “enlightening” as she prepares for her divorce. With offices located in Levittown, Richboro and Doylestown, the Credit Counseling Center makes it easy to work towards improving clients’ financial situation and overall well-being. *Pay Down Your Debt – help stop creditor calls, negotiate lower monthly payments, reduce interest rates, and set up one convenient payment. *Improve Your Credit Score – help you understand your credit report and learn to improve your credit score. *Mitigation Counseling to help you keep your home. *Bucks County Homeowner Mediation Program – work with the Bucks County courts and your lender to guide you through the loan modification process. *Bankruptcy Options – review chapter 7 or chapter 13 bankruptcy and budget and credit counseling. *Reverse Mortgage Counseling – help determine if reverse mortgage is right for you (adults over age 62). *Budget Planning – develop a plan to help ease the stress of living paycheck to paycheck. *Student Loan Options – provide guidance to evaluate student loan repayment options. Credit Counseling Center is HUD-approved and a Pennsylvania Housing Finance Agency approved member. Call Credit Counseling Center today at 215-348-8003 or visit www.ccc-credit.com to schedule your FREE financial coaching session. Make this the year you’re on the road to financial well-being. 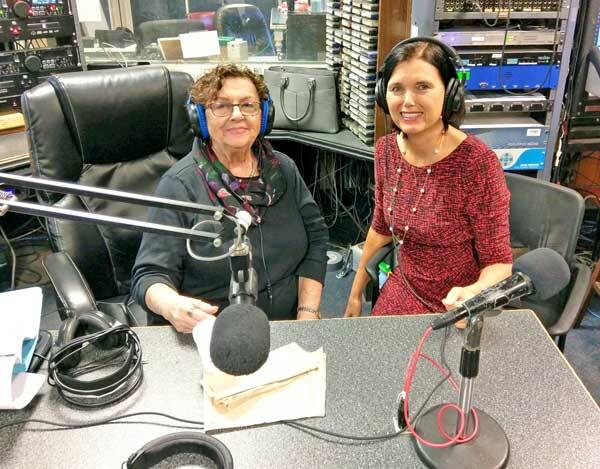 PHOTO CAP: Pat Wandling (left), of WBCB Radio, with Credit Counseling Center President, Joan Reading.